If you have ever wanted to know how to follow in the footsteps of the truly successful without having to spend several thousand dollars attending another one of those seminars then you will want to read Brian Tracy’s book “Create Your Own Future!“. 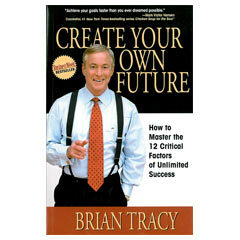 Today I want to talk a little bit about who Brian Tracy is and what this book is all about. I believe when you are done reading this article you will be as interested in buying this book as I was. I’m sure you won’t be disappointed! Brian was born in 1944. By all accounts he had a fairly normal life growing up as a child with three brothers in Canada. What makes Brian’s success so interesting is that he was a high school drop out. He began his early adult life as a laborer aboard a tramp steamer. He did this for about eight years before becoming a salesman. Like most beginning salesmen he struggled at first before deciding that the best way to succeed was to find out just what exactly the top salesman were doing and then copy their actions. This basic idea would eventually lead him to fame and fortune as one of the top success coaches in the world. While he has other successful books and seminars I want to concentrate on his book “Create Your Own Future”. Before I get in to the meaty details I did want to quickly mention that the book is available in ebook form as well as hardback and softcover. The crux of the book is the idea that almost all successful people, no matter how different they may be, all follow the same basic process. In this book he breaks the process down in to 12 steps that anyone can emulate. “Create Your Own Future” tells you exactly how go about setting goals, unleash your creative side, and blast through any obstacles that may come your way. Keep in mind this book is not an inspirational book for coach potatoes to use as a coaster. This book was created for those people who have a burning desire to succeed in any and all areas of their lives and just need a blueprint to follow. If you can supply the passion this book will supply the know how. For what it offers it is very reasonably priced and a book you won’t want to put down. I know you will enjoy it as much as I did. Click here to order “Create your own future” today!